One of my blogging weaknesses is responding to reader comments. I see each one, appreciate the time and effort it took to stop and say something in response to a post, but I rarely leave a reply of my own. Last week's post, in which I expressed my excitement for the upcoming NaNoWriMo, inspired me to do a follow up post on the subject. Instead of responding individually to the commenters, I am going to address some of the excitement and anxiety that NaNo naturally brings. I could feel it between the lines of the readers who shared a comment, and I experience it as well, with each day that draws us nearer to November. I’m still a relative newbie when it comes to NaNo – this will, after all, only be my fourth year with the challenge (and I only officially completed it in 2011). However these past few years have taught me a more about the opportunity, and I would like to use that knowledge to encourage any readers, as well as my fellow writers, who may be standing on the edge of the pool wondering if they will like the water, or if they can even swim the full length. How do you make National Novel Writing Month a successful experience? How do you balance the busy life of a mother/wife/employee (whether you work from home or outside the home)/pre-Christmas/American Thanksgiving? How do you get any sleep? As in other aspects of life, the definition of success is something only you can set. 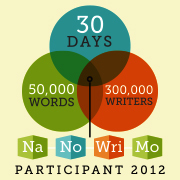 True the NaNo challenge is 50,000 words in 30 days, but that doesn’t have to be your finish line. You can set for yourself whatever goal you choose, and whatever most reasonably meets your life situation. Two years ago I had a newborn, a toddler, a preschooler and a husband working 80 hours a week. I made 14, 000 words and then celebrated, because it was 14,000 words I wouldn’t have otherwise written. What goal is most reasonable for you and your life circumstances this year? Remember that NaNoWriMo is an opportunity to establish habits. If you write everyday of the challenge, you have to pass 1700 words a day to finish in time. That’s more than I typically write in a day (I’m closer to 1000 words), but the excitement of writing with friends and colleagues and the support of family helps push me forward. Finding writing buddies and include your family in your plans. Don’t go it alone! This is very important. If you don’t know anyone, look me up – my NaNo name is milagirl. Don’t ask – old story. I also find the straight red line is a useful tool in meeting word count – I like to see my word count follow it. Above all, don’t become discouraged. The true spirit of this challenge is to bring us together as writers, and give us an opportunity to accomplish something for ourselves. Write daily, with routine, and be accountable to your friends. Help others along. And what I believe to be the most important advice of all: Don’t read what you write – expect it to be rough! This is a good exercise in pounding out a rough draft. It may taste awful on your tongue when you read it aloud in December, but that’s what editing is for! Allow yourself to achieve quantity over quality – just for now. Believe me, you’ll thank yourself later. If you are interested, check them out. See you next Thursday! Thanks for the advice! I've been in the forums the past couple of days trying to make friends. i'm extremely shy, even on the internet. But everyone is so friendly and helpful - I have a couple buddies and even got some help with my current non-NaNo WIP. I love it! My biggest challenge will be curbing my little mental editor - i'm one of those people who edits while they write, which is horribly inefficient. This is all great advice. The link to that second article has now shown me what I want for my birthday- that software looks like so much fun! Like Emily, I think the hardest thing for me will be not going back and re-reading everything I’ve written every time I sit down to write. Must...resist...urge...there’s no time for that!! I am getting more excited now, though. In preparation I’ve been fleshing out my story idea in my head, filling in a few plot holes and thinking more about my characters. Some of those articles will help me to do that even more and get it down on paper as well. Thanks for inspiring me so much!! I am horrible and trudging forward and not rewriting. It kills me EVERY time. I really want to do it NANO this year. I still haven't signed up. I need to get off the fence and do it though.